AIDS activist group ACT UP NY protested two AIDS-related exhibitions at the Whitney Museum of American Art. The protesters targeted History Keeps Me Awake at Night, which features art by David Wojnarowicz, a former member of ACT UP who died of AIDS complications, and An Incomplete History of Protest, which features protest art from the 1940s to the present, including a room devoted to HIV/AIDS-themed videos, posters, artworks and more. David Wojnarowicz with Tom Warren, “Self-Portrait of David Wojnarowicz,” 1983–84. Acrylic and collaged paper on gelatin silver print, 60 × 40 in.Collection of Brooke Garber Neidich and Daniel Neidich, Photograph by Ron Amstutz. 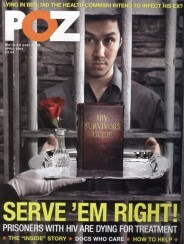 Historicization reinforces distance, a sense of “This is history; this doesn’t affect me,” and therefore does a disservice to present activism: People who think AIDS is over won’t see any reason to donate money to AIDS-related causes, to take the most obvious example. They also won’t see any reason to tell their friends about PrEP and U=U, to take a less obvious one. When arts institutions do not connect historical activism to the present activism being done on the same issue, they are missing an opportunity to reach an interested and sympathetic audience who might then become activists themselves, or who might at least be inspired to read up on the state of the world. They are also keeping relevant information from their patrons, many of whom are upset when they discover they’re only getting half the story. 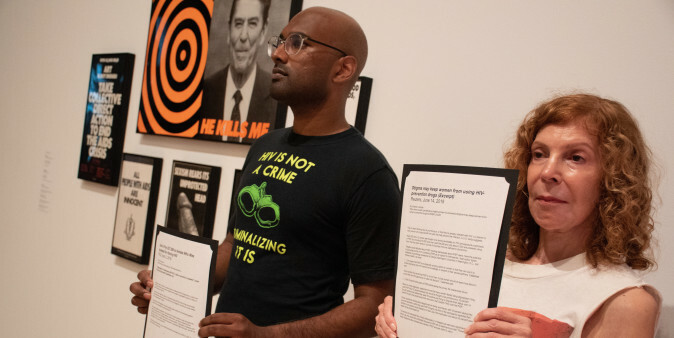 At the protest, spearheaded by ACT UP NY members Ariel Friedlander and Annie Fureigh, according to an article from HyperAllergic.com, activists stood next to specific artworks and held up contemporary news articles about HIV; the articles were designed to look like plaques that hang next to artwork. According to ACT UP NY, the protest had the desired effect, and many museumgoers were engaged in conversations sparked by the news articles. Perhaps most important, however, the website’s statement warns against forgetting the second goal of the protest: the need for public support in the fight to end HIV/AIDS. David Wojnarowicz with Tom Warren, “Self-Portrait of David Wojnarowicz,” 1983–84. Acrylic and collaged paper on gelatin silver print, 60 × 40 in. Collection of Brooke Garber Neidich and Daniel Neidich, Photograph by Ron Amstutz. David Wojnarowicz. “Americans Can’t Deal with Death,” 1990. Two gelatin silver prints, acrylic, string, and screenprint on composition board 60 × 48 in. Collection of Eric Ceputis and David W. Williams. David Wojnarowicz, “Untitled (Green Head),” 1982. Acrylic on Masonite, 48 × 96 in. Collection of Hal Bromm and Doneley Meris, Image courtesy of the Estate of David Wojnarowicz and P.P.O.W., New York. Collection of Hal Bromm and Doneley Meris, Image courtesy of the Estate of David Wojnarowicz and P.P.O.W., New York.